Over the last month I have been reading two (overly-long) books about new political and economic strategies, in parallel: Charles Eisenstein’s Sacred Economics and Derrick Jensen et al’s Deep Green Resistance. This is a short review of these two books. Sacred Economics is a wonderful summary of the principles and ideals of a Gift Economy. If you want to really understand what’s wrong with our current economy, it’s essential reading, especially for those who find economics bewildering. Eisenstein explains that the current industrial growth economy has evolved like a cancer to sustain itself at any cost, built as it is on cultural disconnection of citizens (making us into consumers, disconnected as individuals from each other and as a species from the rest of life on Earth). Money, he says, began as a token of appreciation and gratitude, a means to facilitate giving without obligation. But as our economy has scaled up, homogenized and globalized, money has become a necessary means of tracking transactions, its spirit and ‘sacred’ meaning have been lost, and the resultant system creates an asymmetry between givers (now ‘suppliers’) and receivers (now ‘customers’) that destroys the affordability and desirability of giving, and concentrates ever-more wealth in the hands of those who already have a lot of it. As money fails utterly to connect gifts and needs, it creates a dysfunctional sense of scarcity (fear of never having enough, and the compulsion to amass and protect private ‘property’). Eisenstein cites John Zerzan as saying that just as clocks create a scarcity of time out of natural abundance, so money creates a scarcity of material things. He goes on to explain that the appropriation and accumulation of private property is always tantamount to theft, and its extension to intellectual and social ‘property’ is an abomination. Nearly every good and service available today, he asserts, meets needs that were once met perfectly well for free. The final insult in this dysfunctional chain, he explains, is the usurious charging of interest on yet another form of immorally aggregated privatized property — financial capital. It creates a ceaseless imperative for accelerating growth and debt that is destroying our planet, and it is essential that we begin to repudiate these penurious debts on a massive scale to begin to stop this destruction. Negative interest rates (“free money”) to discourage hoarding of wealth and redistribute wealth and income; this systematized and continuous devaluation would apply to all financial balances and also to cash. Once these things were introduced to replace our current money, currency, economic and tax systems, Eisenstein claims, a Gift Economy would begin to emerge naturally, spurred on by these incentives and disincentives. And perhaps it would if it were somehow possible to gently dismantle the existing economy to put all of these things in place. Unfortunately, it is not, and no amount of wishful thinking and consciousness-raising is going to change that. Our current economy has evolved over centuries as a self-reinforcing system, and its fearful and well-propagandized supporters (the politicians, bankers, police, right-wing, wealthy, wealthy-wannabees and other members of the unwitting group that Keith Farnish calls the perpetrators of the Tools of Disconnection) will violently oppose any attempt to demolish it. It is not in our nature (or even our collective capacity) to simply take an existing human system and replace it wholesale with a better one. It has never been done and never will. If we are hugely fortunate, when the industrial growth system starts to fly apart and collapse through its own unsustainable failings (a process that’s well underway for all the attempts to cover it up), some collective of smart, generous, articulate people might start to put some of Eisenstein’s ideas to a real-life test. But I wouldn’t count on it. When things start to collapse, panic, denial, blame-seeking and reactionary thinking are more likely human responses. Most of the population is never going to join an actual resistance. We’re social creatures, and it’s hard to stand against the herd… Conformity brings rewards and privileges; fighting back brings punishment and alienation. Most people are not psychologically suited to the requirements of resistance. The sooner we accept that the better… The collective decision [of the environmental movement to date] has been to reject the possibility of a serious resistance movement. That conclusion has been fostered by many cultural forces [including those at work in our religious beliefs, individualism, salvationism, classical liberalism, idealism, the alternative culture movements, permaculture, simple living, and the Transition movements]… These people obstruct any attempt to conceptualize how resistance to industrial civilization could be organized… What’s missing is the recognition that political resistance is necessary… [Relying on individual efforts, hoped-for large-scale “paradigm shifts”, education, and personal and community preparation for major change] is not enough. Much of the second half of the book consists of Aric McBay’s analysis of how resistance movements have (and have not) succeeded in the past, and Derrick Jensen’s “Q&A” answers to the most common questions about the risks of getting involved in active resistance to an established culture (they’ll be familiar to you if you read his column in Orion magazine). 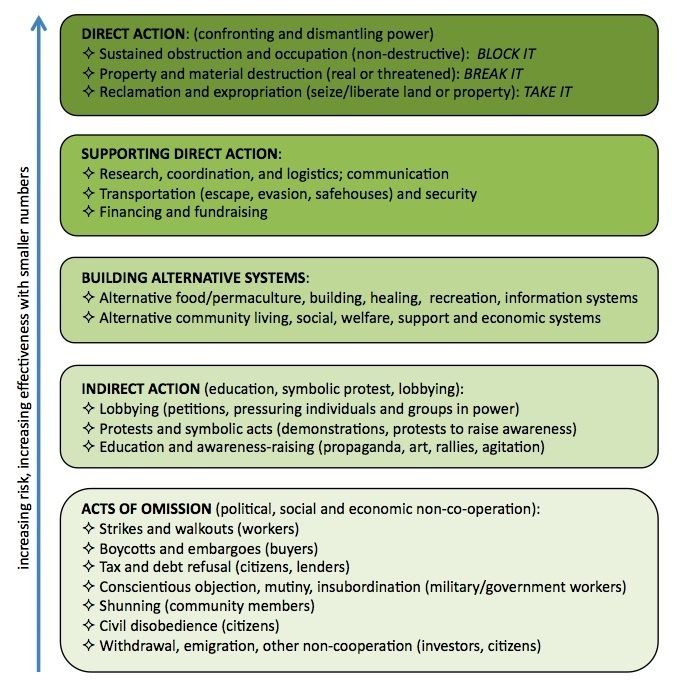 The most useful tool, at least for those still in the early stages of girding ourselves up for resistance, is McBay’s chart of forms of resistance that he calls a ‘taxonomy of action’. 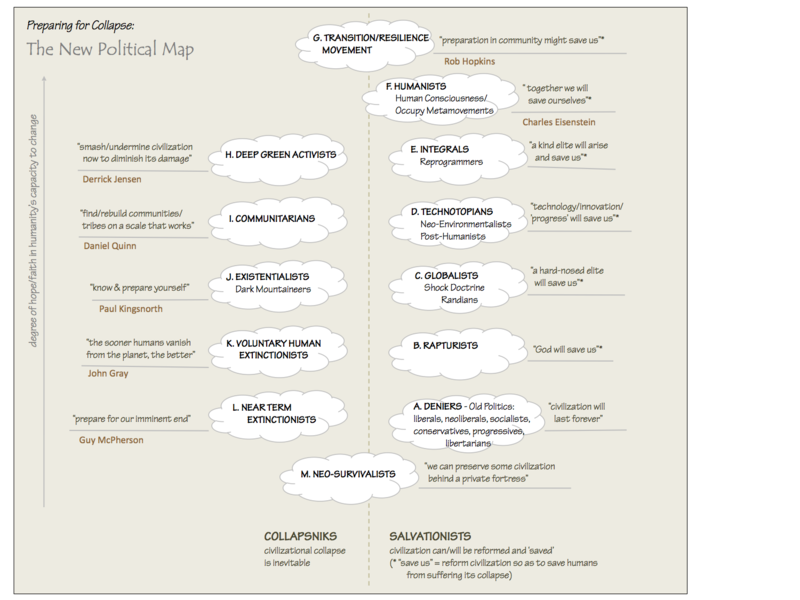 I’ve captured what I think are the major elements of it in the chart above. The key message of the book is that what is needed now are more people to work, either above-ground or underground (they make the important point that members of the resistance need to be one or the other, with a clear wall between them), on the three forms of Direct Action: block it, break it, or take it. I’ve written before about some ways we could apply this to stopping the Tar Sands. I’d encourage you to buy or borrow both books, Eisenstein’s to understand why our current economy is broken and how it got that way, and Jensen’s to start to think about what you might be willing to do to help bring it down. Wonderful book reviews! The chart is very helplful in understanding effectiveness of different kinds of actions. I’m currently reading Deep Green Resistance, and recommend the website http://deepgreenresistance.org/ for anyone who wants to be involved in the movement itself. I’ll pick up Sacred Economics next, thanks for the recommend. Enjoy your blog, will be back to read more. Hi Friend, Awesome blog. I will post a link on my facebook page.